PRESIDENT Emmerson Mnangagwa has scoffed at MDC leader Nelson Chamisa’s attempts to rope in a foreign interlocutor to mediate in talks between them, the Daily News can report. Chamisa is currently on a diplomatic offensive to regional countries, drumming up support for an internationally-backed mediator to break the country’s political logjam. This came after Mnangagwa initiated talks involving all the candidates that participated in the July 30 presidential polls in an attempt to end the political discord that many believe could be contributing to the crisis ravaging the Zimbabwean economy. Yesterday, presidential spokesperson George Charamba dismissed Chamisa’s effort, saying the MDC leader should see the light and join those who are already in talks. “The solution is within the country and not outside. The problem is that he (Chamisa) is not part of the national dialogue. No solution will be found outside the country,” said Charamba, who is also the deputy chief secretary to the president. While Mnangagwa has been persistent with his version of national dialogue, the initiative has struggled to gain traction. Chamisa was the first to throw spanners into the works after he declined an invitation to participate in the talks saying they were conditions which had to be met before dialoguing. One of the conditions was that Mnangagwa must accept that he does not have the legitimacy to govern following the disputed July 30, 2018 election results. More people have since abandoned the national dialogue, accusing the Zanu PF leader of being insincere. On Tuesday, another losing presidential candidate also poured scorn on the talks saying they are just meant to hoodwink the world into believing that parties in Zimbabwe acquiesce to his contested legitimacy. Violet Mariyacha, leader of the United Democracy Movement, said the talks were not inclusive as they have been snubbed by other key actors. “There is no serious discussion of why the country is in this current economic meltdown; why has Zimbabwe failed to attract foreign investments and what or where are the billions (of dollars) that Zimbabweans were told so and so are bringing into the country from the ‘Zimbabwe is Open for Business’ mantra,” reads part of her statement. Mariyacha said there was an attempt by the conveners of the talks to frogmarch opposition party leaders to affirm Mnangagwa’s constitutional legitimacy, ostensibly to resolve the political crisis issue, propel the re-engagement process and lead to the possible removal of sanctions. “This shows that the president is more concerned about his legitimacy and removal of sanctions,” she said. 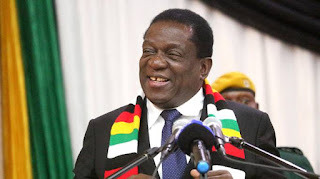 Mnangagwa, who succeeded former president Robert Mugabe through a soft coup in November 2017, has been working around the clock to convince the world that he is a different leader to his mentor and has since engaged a reputable American lobby organisation in an attempt to have sanctions imposed on the country lifted. After giving Mnangagwa a fresh start, western nations, appalled by his clampdown on protests in August last year and in January this year maintained sanctions on Zimbabwe and some individuals much to the chagrin of the ruling party which is seeking new lines of credit to jumpstart an otherwise comatose economy. In a statement, MDC spokesperson Jacob Mafume said Chamisa will not stop in his diplomatic offensive. “The people’s president has been engaging the international community in a bid to get a lasting solution to the plight of Zimbabweans. He will be travelling to most neighbouring countries including Mozambique, Tanzania and Zambia. Chamisa has already met with South African President Cyril Ramaphosa among other African leaders.